Hello everyone, and welcome to Gaming Instincts TV and your pro tips & tricks guide for Sea of Thieves. 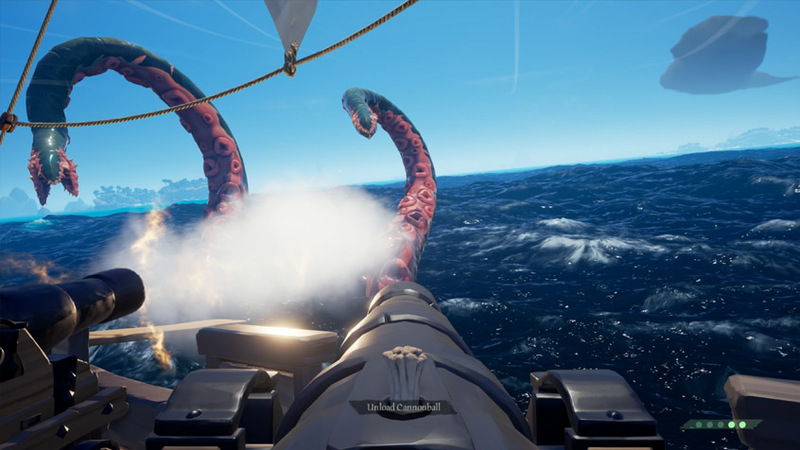 In this guide will be teaching you the best way to defeat the strikingly massive and frightening Kraken in Sea of Thieves. Alrighty, boys and girls here we go, let’s destroy and annihilate this beauty of a beast. 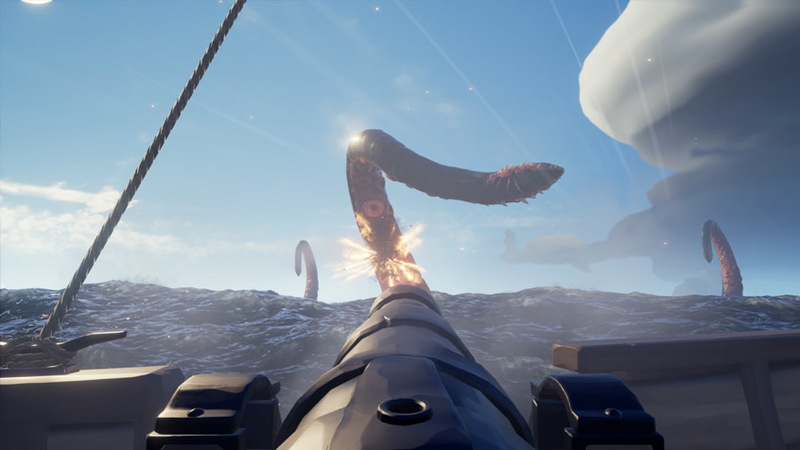 The Kraken in Sea of Thieves is a random encounter that can happen at any time of day and anywhere in the game. How do you know if you’re about to get attacked by a Kraken? You will realize that a few tentacles are about to pop out when the water turns super dark and creepy music starts playing. 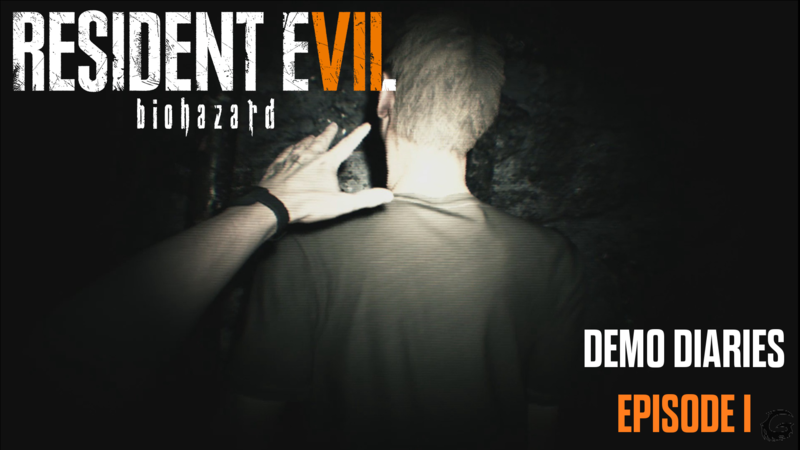 Sometimes you will also hear terrifying monster noises at night in the game as well. Believe me, it’s quite frightening. 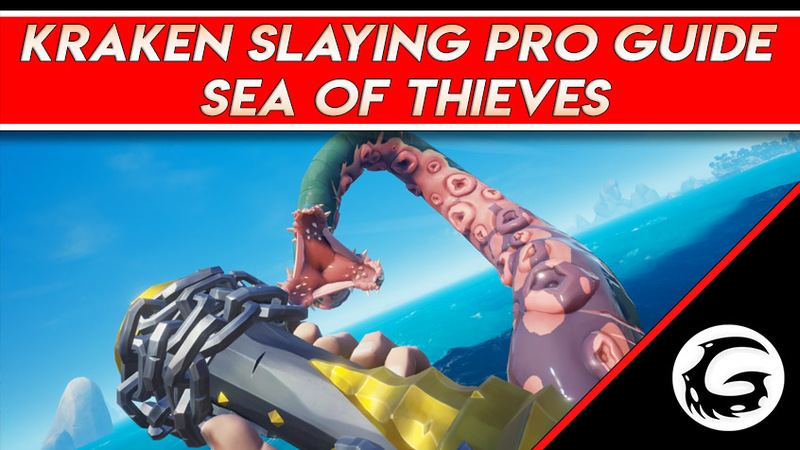 With that being said, let’s begin our epic slaying guide for the Kraken in Sea of Thieves! First things first, the Kraken has eight tentacles total that you need to destroy, sometimes the tentacles will appear in the distance and go underwater and then reappear closer to your ship, which means the Kraken is about to initiate an attack on your ship and crew members. The Kraken has two main attacks, one that lands its tentacle on your ship and starts tearing it apart, which causes sinkholes in the hull of your ship. 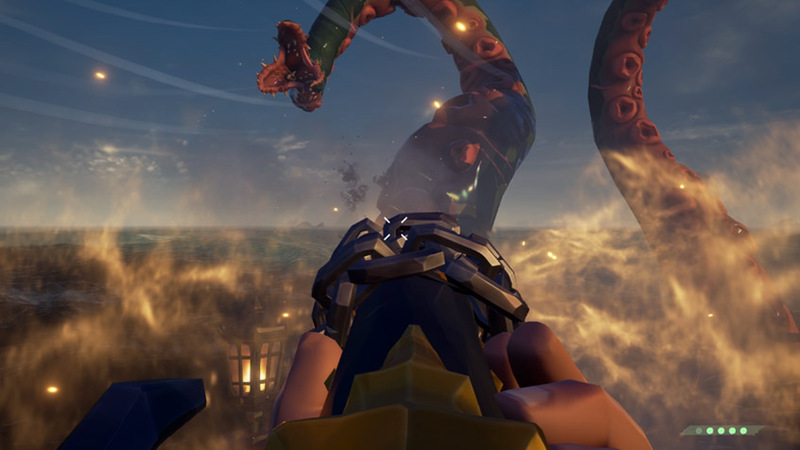 The tentacle that’s on your ship will be taking priority, and you need to attack it as fast as possible or your ship will sink if you do not do it in time. After the tentacle is off your ship, immediately send two crew members to fix up the holes and bail the water out as soon as possible. Do not worry about the other tentacles when the ship is in need of immediate attention. Some of the tentacles will also attack you by sucking in one of your crew members in its mouth. If you don’t hit it to save them, then it will take the victim underwater and drown them. If they die, they will respawn on the ship along with your other crew members. So do not panic if you did not manage to save the victim. 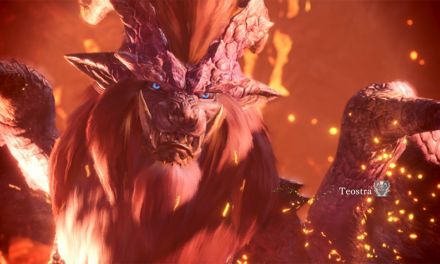 Overall, the boss’s mechanics are quite simple and not too complicated, as long as you keep calm and are willing to learn the fight during your first encounter. Follow the next steps you should be okay. As soon as you find you’re about to fight the Kraken, make sure all of your cannons are loaded up with cannonballs because your crew members will be making great use of them. Also be sure that everyone is stocked up on planks for ship repair. Have your captain—or whoever is in charge of your group—designate people to certain tasks. For example: one person will be responsible for repairing the ship if things get really bad using the planks, and another person will be responsible for bailing the water out of the ship with their trusty bucket. The third person should be designated to one of the sides of the ship to man the cannons and be ready to blast the Kraken with cannonballs. And you, of course, should be on the other side of the ship, manning the other cannons. Obviously, if the ship is not in need of any repairs, then everyone’s job is quite simple: damage the Kraken as much as possible and as fast as possible. Before you start attacking the Kraken, make sure that you equip a Blunderbuss for when the tentacles get really close to your ship, or when they land on it. For your other weapon slot, equip the Eye of Reach for medium to long distance shots. Beside the cannons, the Eye of Reach will probably be your main weapon for the entirety of the fight. Once the fight starts, the very first thing you want to do is pick the tentacle that’s closest to your ship, as the distance of the tentacle is what determines the biggest threat to your crew. Make sure every team member is focusing fire on one tentacle at a time. There is no need for splitting up damage. The more tentacles that stay up, the harder it will get overtime, and the faster you will run out of your resources if you keep getting attacked. It’s also worth noting that it takes five dead-on cannonball shots on a tentacle to completely kill it off. In the beginning, you definitely want to make use of the cannons as much as possible. Remember that your cannonballs are limited so DO NOT miss your shots and always aim for the bottom of the tentacle because it’s a lot easier to hit than its upper portion, especially considering it’s moving and waving all the time. If you’ve hit the tentacle successfully with a cannonball, eye of reach, or any kind of bullets, you will hear a small musical trill that sounds like this “Plays queue.” That means you’re doing damage. 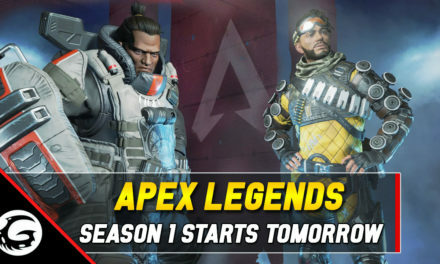 You will also see a hit marker pop up. Once the tentacle is dead it will do a special death animation and also play “victorious” musical queue. If the tentacle lands on your ship, immediately have all your crew members pull out their sexiest Blunderbusses and start shooting the hell out of it. This will do a ton of damage to the tentacle and also get it off your ship at a pretty fast rate. If you run out of bullets for your Blunderbuss or Eye of Reach, just make a quick run down to the second deck and resupply with ammo from the ammo box. You may also use your cutlass if you wish, but I do not recommend it because you have to be right next to the tentacle, and that’s a waste of time. Using the cutlass does not do the same amount of damage as four people firing at it with Blunderbusses. If one of your crew members gets sucked into one of the tentacle’s mouths, simply shoot it with your Eye of Reach as fast as possible. Again, aim at the bottom because it’s easier to hit. It does not matter where you hit the tentacle, there is no headshot damage or anything like that. As long as you keep hearing the musical queues and getting hit markers, that’s all that matters. Even if a crew member does get taken underwater and they die, do not panic. As I’ve said previously, they will respawn on the ship with you, and you may continue on. Rinse and repeat these steps and the Kraken will be slain. As you take out the tentacles one by one you will realize that the Kraken is not really that scary. The more tentacles you kill, the easier the fight gets. However, just because it gets easier does not mean that your crew can relax. Always stay focused, use this guide as your trust-worthy handbook and you and your crew will successfully defeat the Kraken. Once you defeat the Kraken the black water will fade away, and you’re free to continue your epic pirate journey to becoming a legend. What are the benefits of defeating a Kraken? Well, to be quite honest if you have a lot of treasure on your ship then the reward is simply surviving and getting the treasure safely back to the Island Outpost for you to turn-in. The fact of the matter is that Kraken is just a cool gaming experience in Sea of Thieves and right now it does not bring in any actual in-game rewards or anything of that sort, other than an achievement. However, Rare is thinking of putting in a public trading company that strictly focuses on hunting Krakens. We hope that this guide has been helpful, and congratulations to you and your crew members for defeating the Kraken! Don’t forget to check our main Sea of Thieves guide page for more great pro tips & tricks during your epic sea journeys.